Are you on vacation and looking to schedule affordable portrait photography session? Blinnk Photography removes the hassles and headaches typically associated with booking a vacation portrait photographer on the fly. We have streamlined our processes to allow our service to be more flexible and more efficient, delivering greater convenience and cost savings. So, whether it’s just you, your significant other, or your whole family; Blinnk Photography can ensure you a fast, fresh, fun photography experience, high quality photos, affordable pricing, and exceptional customer service. 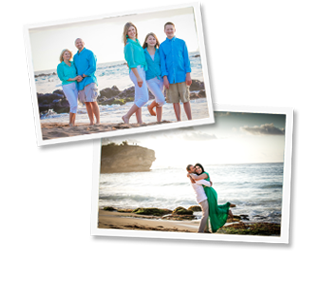 Contact us to schedule your free portrait photo session on: Maui, Kona, Oahu, Kauia. Our photographers are experienced professionals who love what they do, and have completed hundreds of portrait photography sessions. The day before your shoot you will receive a reminder email which will also include tips on what to wear for your shoot and items you may want to bring with you. Your Blinnk photographer will guide you through the shoot, making sure to capture a variety of photo types while framing in the beautiful scenic backdrops. Make sure to let your photographer know if there are ideas you would like to try; at Blinnk we give you room to be creative and make the experience your own. At Blinnk we believe in the quality of our service and the ability of our team. This confidence allows us to break the rules of professional photography and offer photo shoots with no obligation to buy. Instead, we allow our product to speak for itself. After your family photo shoot you will be able to select which images you want to purchase. Pick a little, pick a lot, it is completely up to you.